Dream a Bigger Dream: A Story of Design — ColorWord Creative, Inc. These words were brightly illustrated across the top of the page, emitting rays of sunlight that framed the whole piece and drew attention to a crowd of people dancing in the street below. It was a scene full of color, life, and heritage, all rolled together in one. I could instantly ascribe a narrative to the illustration that went a little something like: This is a collection of people who value eating together, desire to share music with one another (even if it means dancing in the street) and seek ways to draw out the natural beauty and infectious life of their community. This piece was one of many that I stumbled across while combing the internet looking for inspiration to create the branding for Centro de Informacion’s annual benefit gala. Our goal was to create an event brand that accurately depicted Mexican aesthetic themes and simultaneously carried the narrative of the event theme: Dream A Bigger Dream. 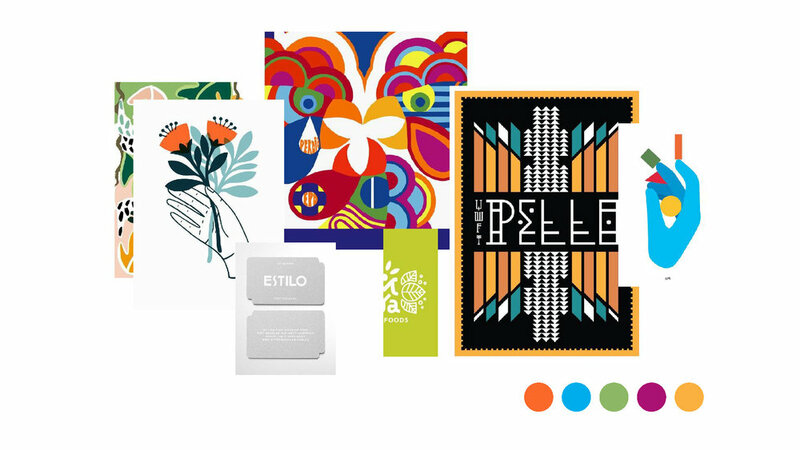 We start with mood boards—collections of images, text, colors and other small pieces assembled to set a general tone and aesthetic for any new design project. For Dream A Bigger Dream, the first mood board I curated was primarily driven by flat shapes, bright colors, and accents created through thin, well-calculated, lines. The second was more organic, more gestural (as if pieces of each composition were chaotically thrown there), and its colors were natural looking but seemed to be sun-bleached. Merging the fluid shapes and sun-bleached technique from Board 2, traditional accents inspired by Mexican designers, shapes of both the moon and the sun, and a palate of colors, we created the mark as it stands today. The split moon and sun, sun rays and moonbeams in the event’s brand are to depict the multi-meaning of its title. Dreams, in this instance, are not only scenes that take place while asleep, but the deep inspiration and aspirations that move entire communities forward. The title is a nod to brave immigrants from all over the world who dared to pursue the American Dream, and the traditional Mexican accents and faded concrete backdrop are inspired by the many DACA recipients or “Dreamers” who are not US citizens yet have known no other home. Dream A Bigger Dream’s event brand is a narrative of those who want to change their own lives, who fall asleep wondering what a different life could be, and who spend their waking hours working to make the world a better place for everyone. It is meant to be a meaningful depiction of how much more beautiful, vibrant, and utterly delicious the flavor of our dreams become when we dare to chase them together. P.S. If you would like to experience the full suite of items we designed for Dream A Bigger Dream at the gala itself, you can buy tickets at centro18.gesture.com. And to read more about Centro de Informacion and the important work they do in our community in Elgin, IL, visit www.centrodeinformacion.org.